The following is a real-world example of one of our valued customers who was finding the issues arising from increased presence in Europe increasingly difficult to manage cost effectively. EBISS provided them with the pieces of the puzzle that they were missing. The Challenge: A large US Biomedical Research company was attending more and more events and exhibitions within Europe and they were encountering many issues that they had not foreseen. This included Customs restrictions, lights or accessories not working and the stands becoming damaged. This was in addition to the forever increasing cost of logistics they were encountering from transporting everything backwards and forwards across the Atlantic. The Solution: They needed a European based company that could eliminate these issues and that could be trusted to not only erect their stands correctly, but to look after them between shows too. Their solution was to contact EBISS! 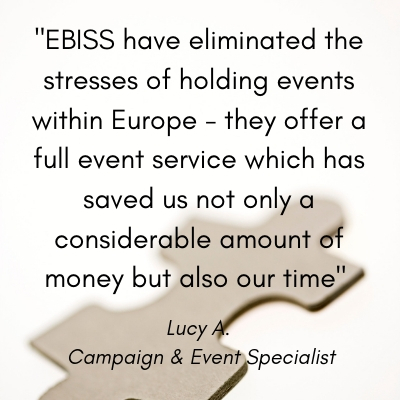 The Benefit: EBISS was the perfect match for their needs, as not only do we have offices in the US and UK, we have vast experience of transporting equipment throughout Europe. We can deal with every element of attending an event from initial stand design through to warehousing, shipping and fulfilment along with providing our customers regular communication. Through effective work practices and many years of expertise, we were able to identify ways that we could help this customer reduce costs, whilst maintaining and building on their European presence – all without adding to their workload. Customers Displays – When exhibiting in Europe, many US booth sizes (both width and height) are not always compatible with European booth layouts. Also, voltage is different meaning lights and accessories will not work in Europe unless you have a voltage converter and the correct adapters. 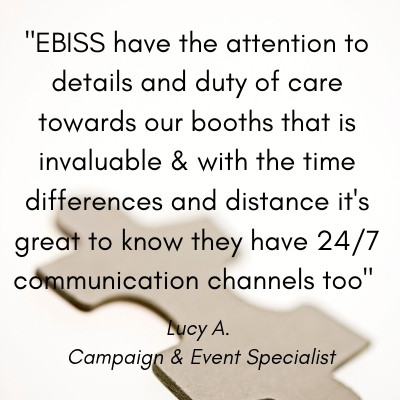 EBISS provide European compatible booths whether portable, modular or custom build. By having it manufactured in Europe they didn’t have to worry about the cost of international shipping and Customs duties, or loss or damage in transit. This offered them a cost saving. Centralised Warehousing – With our modern and secure warehouse and offices just outside of London, we are in the best possible position to store customer stands for European events. We also have floor space to set-up every stand before each event to enable us to perform condition checks or display new graphics for a pre-show check. Printing & Fulfilment – They sent over their artwork files and we arranged the printing of not only their collateral but also graphics panels for new banner stands. Due to the differences in the US and European paper sizes the customer was sent proofs and samples for approval prior to printing. This saved them considerable time and expense, as well as eliminating the need again for costly International shipping. They also made use of our fulfilment and give-aways capability – sending across their lanyards and giveaways, which we then stored, distributing the correct quantities as requested across their various European events, and stored securely in between events. Shipping, Set-up & Dismantling – We use our own vehicles and personnel to handle all our exhibition equipment, and set the booth up at the venue, ready for our customers’ arrival. At the end of the event we repack all the materials, dismantle the booth and return everything safely into our warehouse ready for their next event. We also run an online inventory which gives our customers an online portal where they can view all items being stored, meaning they can check quantities whenever they want and we will even send photos of your items if you need reminding. 24/7 Communication – Thanks to our offices in the US and UK we can offer a 24/7 communication, and we can also offer webchat via our website and an out of hours telephone support number if needed. This gives our customer the reassurance that they needed to know that if they encountered a problem, leading up to or during and event it could be resolved without the constraints of time zones. If you have an event coming up that you are considering, let us know what you are looking for and we will help you acheive it. Our job is to make the logistics in your life easier!